The NSW Parliament has participated in the signing of a new Memorandum of Understanding that will ensure the continued development of the Parliament of NSW Aboriginal Art Prize; an annual exhibition designed to recognise and promote Aboriginal artists in NSW. 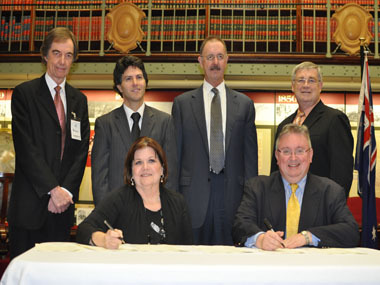 The agreement between the Parliament, Campbelltown City Council, Arts NSW, the College of Fine Arts and new event sponsor, Coal & Allied, was signed at a special event at the Parliament on Friday 24 June, hosted by the Presiding Officers. In attendance was the Minister for Aboriginal Affairs, the Hon. Victor Dominello; members of the arts and Aboriginal communities and senior sponsor representatives including Bill Champion, Managing Director of Coal & Allied and Cr Paul Lake, Mayor of Campbelltown City Council. "The Parliament of NSW Aboriginal Art Prize is an important forum through which Aboriginal artists of all skill levels can reach NSW communities," said the Hon. Don Harwin MLC, President of the Legislative Council. "We are pleased that we are able to sign this important agreement, which will ensure the continued provision of this fantastic opportunity for artistic expression and growth." Inviting parties to sign the new agreement, the Hon. Shelley Hancock MP, Speaker of the Legislative Assembly welcomed the new partnerships as a positive step forward for the future of the Prize. "We welcome back our ongoing partners in Campbelltown City Council, Arts NSW and the College of Fine Arts, and we are excited to form a new and positive relationship with Coal & Allied," says Ms Hancock. "We at the Parliament look forward to working with all groups on the continued development and growth of this important community event." Now in its 7th year, the Art Prize has become a highly anticipated event on the NSW arts calendar, with past winners including the Euraba Artists and Papermakers and celebrated solo artists Roy Kennedy, Danny Eastwood, Milton Budge and Garth Lena.